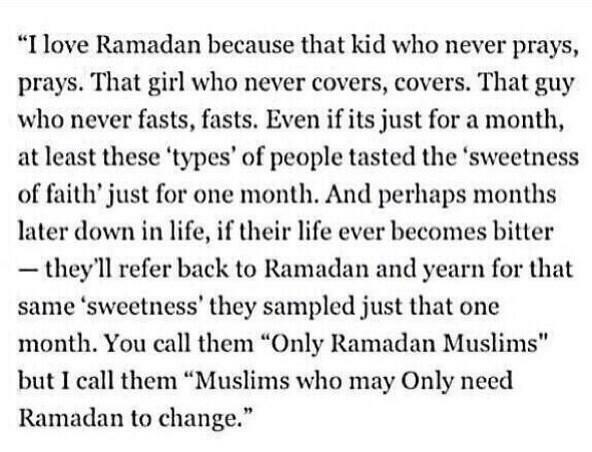 This is why I love Ramadhan! Love Ramadan for others just as you love it for yourself and rather than rebuking or scolding someone, make sincere du’a for them. Subhanallah! Allah Ta’ala is watching. Allahu Akbar! Allah Ta’ala is All Hearing, All Knowing, He is Omnipresent. He sees and knows when we cheat while fasting, thus we resist all temptations of food, drink and lawful conjugal relations from dawn to dusk. We have learnt the lesson of Taqwa. We have learnt that lesson which the fasting was meant to teach us. Allah Ta’ala is watching! Yes, Allah Ta’ala is Watching! Every time there is an urge to eat or drink while fasting, the voice from within cries out: “Allah Ta’ala is watching!” Dozens of times daily for an entire month this reality is reaffirmed. Allah Ta’ala is watching. So deeply is it embedded in the heart that by the time Ramadhaan is over, a person becomes conscious of Allah Ta’ala to such an extent that he is now guided by an inner force that propels him in the direction of righteousness and turns him away from sin. The fasts of Ramadhaan were prescribed for the purpose and object of attaining Taqwa. This is clearly declared in the Qur’an-al-Kareem. Taqwa simply is to obey the commands of Allah Ta’ala and refrain from all sin, The increased rewards for lbaadah (worship) in Ramadhaan and all the blessings of this great month should be considered as the bonus. The object is Taqwa. If one performs an abundance of Salaah, completes the recitation of the Qur’an thirty times and engages in many other acts of lbaadah, but fails to give up sins – one has failed to achieve the object and purpose of Ramadhaan. One has failed to firmly embed the reality of Taqwa in the heart, the Taqwa that cries out “Allah Is watching” whenever one contemplates committing any transgression. The dictates of Taqwa are not restricted to abstaining from drinking, gambling, adultery, transacting in interest and other such vices. Indeed Taqwa demands that while abstaining from all the above vices one also observes Taqwa in one’s business. When the temptation to cheat the customer beckons, or when one is tempted to buy stolen goods, or to indulge in fraud, at that time also the heart should cry out “Allah is watching” and it should restrain one from the sin. Similarly, Taqwa demands the fulfillment of the rights of the husband/wife, It also demands the joining of family ties. It demands respect for the elders and kindness for the young. Taqwa entails, among other aspects, being honest and clear in all monetary dealings and social interactions. Hence when there is a wedding or funeral, or at the time of distributing the inheritance of the deceased, the same level of Allah consciousness must be displayed as was apparent when refraining from drinking the cold water while fasting. Likewise, when the laws of purdah are violated, does the heart cry out “Allah is watching”? Or when one intends to watch something on TV., which will most definitely involve one in zina of the eyes and ears, does one hear the voice from within: “Allah is watching,” as a result of which one refrains from that sin? The same pertains to the Shari’ aspects of appearance and clothing. How often have we done things to appease and please even the enemies of Allah Ta’ala and Rasulullah (sallallahu alaihi wasallam)? How often have we abandoned the dictates of Taqwa in order to earn a few coppers? Now is the time to sincerely repent. It is the time to say “Allah is watching” and to do everything to please Him. It is a time to acquire Taqwa. This then is the object of Ramadhaan. This will only be achieved if we conduct ourselves in this great month with Taqwa. Or else the object of Ramadhaan will be defeated. Hence Rasulullah (sallallahu alaihi wasallam) is reported to have said: “He who does not forsake lying and other futile actions, Allah Ta’ala has no need for him to give up his food and drink.” Thus together with fasting, performing Salaah, reading the Qur’an, serving the cause of Deen, etc,, one must totally abstain from every sin in the month of Ramadhaan and adorn oneself with Taqwa. Insha-Allah this will then carry one along for the rest of the eleven months to abstain from all sins. May Allah Ta’ala enable us to make this Ramadhaan a month where we will truly attain Taqwa. Aameen. Ramadhan is a good time to win over the hearts of your beloved husbands. Some ladies feel that Ramadhan is for worship only, so the family has to be content with whatever is available, and that they should not waste time in the kitchen. Therefore they just worship and they are not careful about iftar etc. However, that’s not true. The time spent in the kitchen is not wasted. It’s worthwhile and It’s time well spent, because as the saying goes ‘Khidmat se khuda milta he, Ibadat se jannat” i.e., with servitude we get Allah, with worship we get just paradise. So when you work hard to feed your kids and look after your husbands, you are actually striving for the pleasure of Allah. So, learn how to cook properly, avoid ordering takeaways, cook some delicious food for the family and reap both benefits; winning over your husbands and attaining Allah’s pleasure. Yes! Don’t overdo things and don’t waste time in making things which require too much time and effort, things which can be cooked outside Ramadhan. Use time wisely for some tilawat, tasbeehaat, and duas as well. May Allah make the fasts and household work easy for our ladies, and reward them in full for the amazing efforts they make in keeping everything in order for iftar and suhoor. Ameen. He who wastes his time in Ramadhan is truly deprived of the virtues and forgiveness of this month. The sahabah ﻰﺿر ﷲ ﻢﻬﻨﻋ ensured that not a moment passed in futility. They would complete their worldly tasks and free themselves two months prior to Ramadhan i.e. by Rajab. Allah’s acceptance of a fast is not just conditional upon remaining hungry or thirsty but is also dependent upon the fasting of the other bodily organs i.e. the eyes, ears, heart, mind and especially the tongue. Abu Hurayrah ﻰﺿر ﷲ ﻪﻨﻋ reports that Allah’s Messenger ﻰﻠﺻ ﷲ ﻪﻴﻠﻋ ﻢﻠﺳو said ‘Fasting is not merely abstaining from eating and drinking. Rather, fasting is to refrain from futility and indecency. So if someone abuses you or behaves ignorantly towards you, then say: “I am fasting” ’. [Reported by ibn Khuzaymah]. When fasting we should not even shout or raise our voices let alone argue. This is the month in which we should all remain silent as much as possible and not say or do anything which inconveniences others.